You spend a lot of time and cash getting the grippiest, stickiest, longest-lasting and best-fitting climbing shoes you can possibly find for your feet. Then you slap some cheap chalk on your hands and call it good. Make sense? Friction Labs thinks not, so they created a better, grippier, longer-lasting chalk by making it with more magnesium carbonate than all the other white stuff. This American company believes that chalk matters, so they've designed this special blend with more magnesium carbonate than the stuff you're familiar with, so you can get a grip like no other. 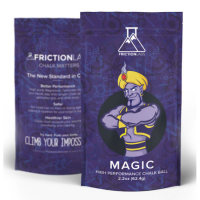 Put your awesome FrictonLabs climbing chalk in a just-as-awesome sock! The Magic is a reliable, refillable fabric sock designed to create as little mess as possible.